Whenever I have a craving for comfort food, it would be safe to assume that either rice or pasta will be involved. Rice is a necessary accompaniment to the dishes of my childhood; it goes with everything from chicken stew and sautéed vegetables to marinated meats like tocino and tapa. Characterizing pasta as comfort food for me did not happen until I learned to cook in my own kitchen. I have always enjoyed pasta dishes but I admit that my very early exposure to Italian food was limited to such ubiquitous restaurant fare as Alfredo and meat sauce. Fortunately, my Italian cookbooks have given me a better understanding of what “sauce” really is. Pasta sauce doesn’t have to be made up of tomatoes or cream. A simple pasta dish can be special with the addition of just a few humble ingredients and the sauce will neither be called “red” nor “white”. This is my take on a Venetian classic, Bigoli con Salsa, a traditional dish for days of fasting. Bigoli is an extruded pasta that is traditionally made with either buckwheat flour or whole wheat flour. The sauce is a simple combination of olive oil, onions, anchovies and parsley. This variation includes tuna in olive oil but I went a couple of steps further by adding lemon juice, crushed red pepper and crispy sage. The resulting dish has surprisingly more complexity than other tuna-based pasta dishes I’ve tried before. Tuna fish packed in olive oil has a lot of flavor and frankly, you don’t have to buy the Italian variety to guarantee a successful dish. I keep my pantry well-stocked with Trader Joe’s version. It’s economical and handy for easy meals. The slightly-caramelized shallots I used in place of onions added another layer of flavor–mild sweetness–that I admit wasn’t sure would work well but fortunately did. The crushed red pepper provided a bit of heat and the lemon some brightness. The kicker, though, was the crispy sage. I fried about a dozen in a bit of olive oil and butter. The brown butter gave the sage a subtle nutty flavor, lending even more depth to this simple meal. This may seem like an odd mix of ingredients but I assure you that it worked! I’m happily adding this to my comfort-food list. 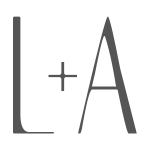 By the way, My Bottega Cookbook giveaway is still going on. Why don’t you drop by my earlier post for a chance to win! Bring a pot of water to a boil. Salt generously and cook the spaghetti until al dente. Meanwhile prepare the sage and sauce. To prepare the sage: Using a large sauté pan that will accommodate the pasta sauce, heat the 1 tbsp of butter along with about three tablespoons of olive oil over med-high heat. Fry the sage leaves for about two minutes, remove from pan and drain on plate lined with a paper towel. To prepare the sauce: Lower the heat on the same pan used above to med-low. Add the sliced shallots and water and cook, stirring occasionally, for about 8-10 minutes until the liquid has evaporated and the onions have caramelized a bit. Raise the heat to medium-high in the last two minutes and cook the onions until they are light golden brown. Add a bit more of the reserved olive oil and the sliced garlic and cook for about 30 seconds. Then add the anchovies and tuna and cook for about three minutes. Add some crushed red pepper, a pinch or two of salt and some freshly ground pepper. You can add the juice of about half a lemon at this point, too. When the pasta is al dente, drain it and add to the sauce. Toss in the pan along with the crispy sage. You can drizzle with more olive oil and add a bit of pasta water if the sauce looks too dry for you. Sprinkle with grated Parmigiano Reggiano before serving. 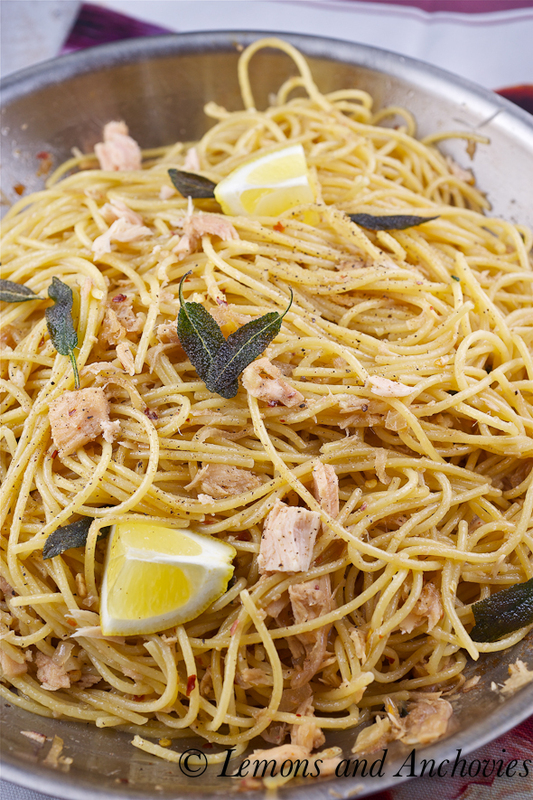 Your Spaghetti with Tuna looks so good! 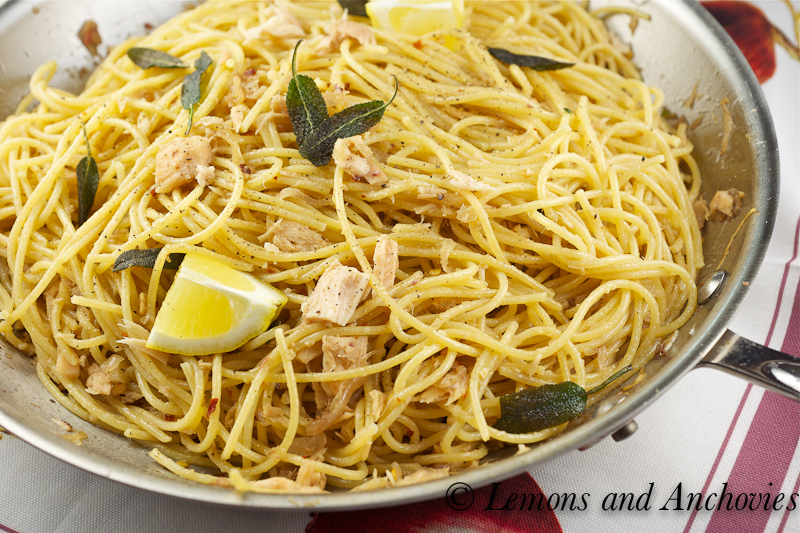 I love making Spaghetti with Tuna, but have never added anchovies or fried sage. What a fabulous idea! Thank you! I think I love this better than those tuna noodle casserole 😛 When I discovered tuna packed in oil, I never went back, TJs makes a decent one. I like everything about this dish. 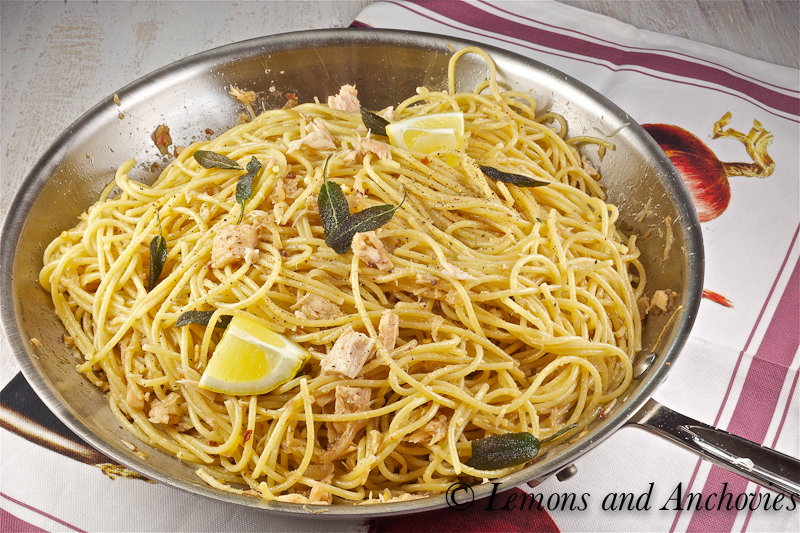 The use of sage, tuna and the saltiness of the anchovies – so many delicious ingredients that make up this pasta dish (love that second image!!! ). I just may give this a try for dinner this week. I never really fell in love with pasta until about a year ago when we started making it fresh and really exploring variations, homemade sauces, unique combinations. 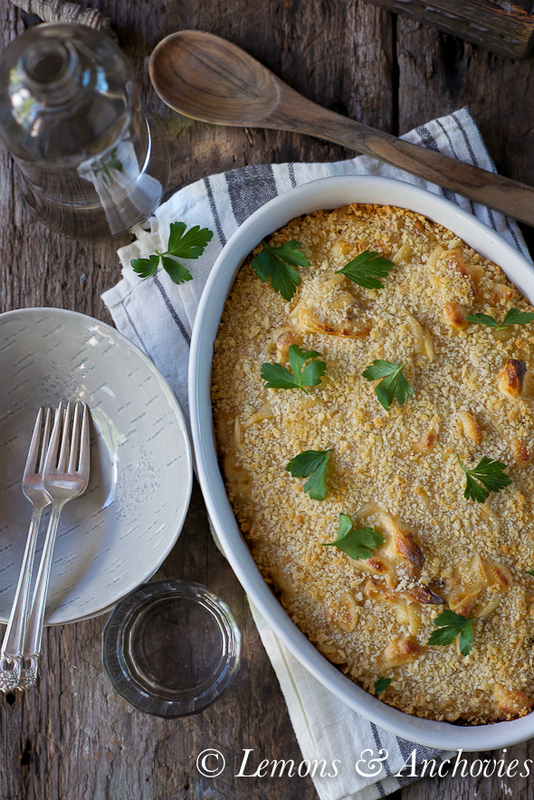 Your recipe looks simple yet interesting- love the crispy sage addition! 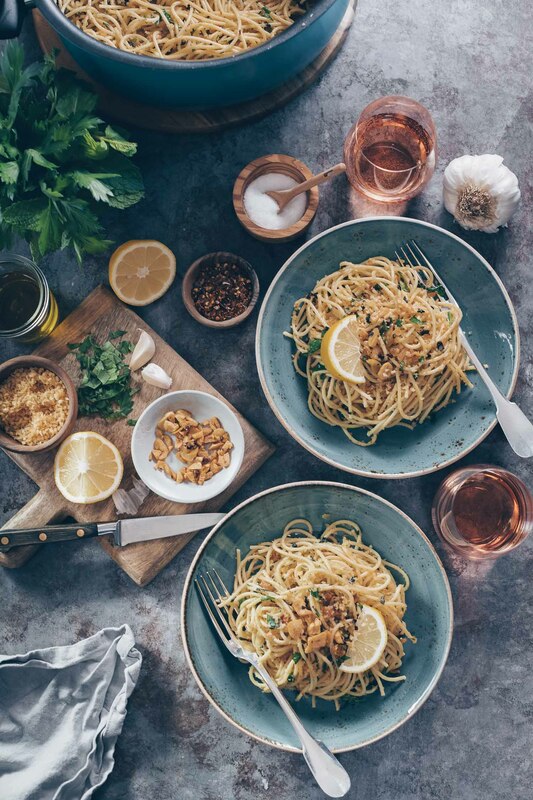 You should already know what I’m thinking about after reading this post…”forget about brunch I want to meet you over dinner so you can make me one of your wonderful pasta dishes”…and if an Italian says so…lol! Fried sage!! mmmm! This pasta dish sound fabulous! Hi Jean, I love the fried sage in your pasta, isn’t it one of the best thing ever? Such a simple yet elegant pasta dish. I’m pretty sure it would land on my comfort food list as well. Very nice recipe! What a perfect looking pasta dish. Definitely comfort food! Gorgeous! 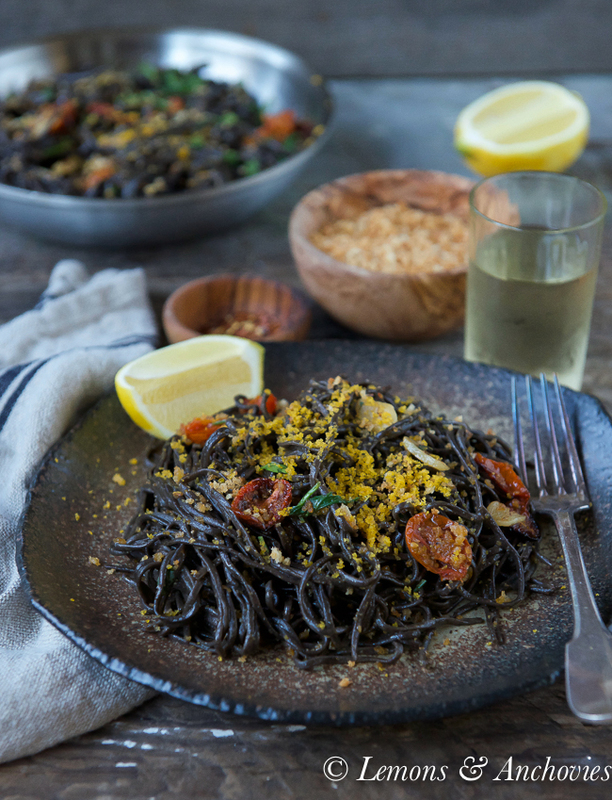 I love to make pasta like this- but never added anchovies! This looks heavenly. Definitely what I would consider comfort food! Jean, have you tried Tonino brand tuna jar? Thick tuna pieces are in a jar and it’s usually sold in a supermarket like Lunardi’s. It’s a little bit more expensive than regular canned tuna, but this tuna is amazingly delicious. I thought this tuna goes well with your pasta… I must make this pasta soon. I love all the ingredients in it, and I’m also not necesarily into cream or tomato pasta. I love anchovies and sage in it… Really, this is a great recipe!